C&IT Venue of the Week is Sunrise Kempinski Hotel, Beijing & Yanqi Island, which marked the completion of Kempinski's Chinese mega-resort when it opened last week. The 306-room, 21-floor Sunrise Kempinski, which opened last week near Beijing, is one of the most striking hotel designs on the planet. The building's shape symbolises harmony, unity and infinity. The front view is that of the ‘Rising Sun’ – symbolic of the fast-developing economy of China, while from the side the Structure is shaped like a scallop, which represents ‘fortune’ in Chinese culture. 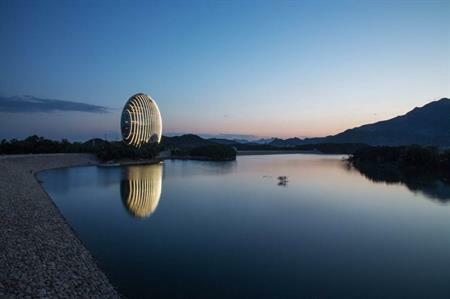 Aside from the aesthetics, the new property marks the completion of Kempinski's Yanqi Lake and Yanqi Island development, the hotel group's largest development in China. Marketing itself as 'a haven of tranquility and beauty', it is destination resort for meetings and events, incorporating 14 hotels, a conference centre and 14,069sqm of meeting space. "Since we opened our facilities on Yanqi Island, we have already to date, hosted numerous large-scale meetings by multinational companies," said Brice Péan, general manager of Sunrise Kempinski Hotel, Beijing & Yanqi Island. "In 2015, the bulk of our MICE business will come from the automobile, pharmaceutical and technology industries. We are also working in partnership with unique service providers such as helicopter services, e-yacht services and hot air balloon services to offer our guests unique and luxurious experiences," he added. Sunrise Kempinski itself features a 1,850sqm ballroom for up to 1,400 delegates and 12 meeting rooms ranging in size from 57sqm to 156sqm. Leisure facilities include Kempsinki The Spa along with recreational and fitness areas, a kid’s club and nine restaurants and bars. Under 40 miles from the centre of Beijing and with views of Yanshan Mountain and the Mutianyu Great Wall, Yanqi Lake offers 14 restaurants and bars, 14 spas, a private marina, and a nine-storey pagoda. The gradual opening of each facility began in November 2014.